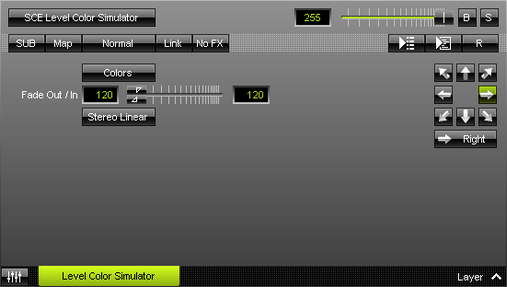 SCE Level Color Simulator simulates audio input and displays the loudness of the input with the help of color. The more input, the brighter the effect. ▪ Fade Out / In - Defines how fast MADRIX displays color. You can specify the fade-in speed as well as the fade-out speed. The default values are 120 and 120. Valid values range from 1 to 3000. Mode - Allows you to choose the mode [Mono, Stereo Linear, Stereo Radial]. This heavily influences the visual outcome of the effect.